Who doesn’t want to turn the clock back and feel younger? Although not all of you might make a big deal out of it, secretly each one of you is worried about getting old. It is estimated that within the next 50 years, approximately 30% of the population will be 65 years or older. Of those between 75 and 84 years of age, 6 million will exhibit some form of Alzheimer’s disease symptoms and those older than 85 years, 12 million will have some form of dementia, states a study published in Free Radical Biology and Medicine in 2001. From going under the knife to buying anti-aging creams to getting hold of wonder drugs, people would go to any extent to fight the aging process. But at the end of the day, we all know we cannot stop aging. What we can probably do is delay aging with a healthy lifestyle. And the good news is the secret to fight aging is right there, stored inside your fridge. According to a study published in Annals of the New York Academy of Sciences in 2006, diets rich in antioxidants may help to reduce the risk of suffering age-related immune dysfunctions and arteriosclerosis. Now, this should be a good enough reason for you to include some wholesome foods in your daily menu. Almonds, walnuts, cashews, macadamia, hazelnut and pistachios benefit your health in big way. Nuts provide several B group vitamins, minerals, unsaturated fatty acids, fiber and phytochemicals including carotenoids, polyphenols, and tocopherols that possess antioxidant functions. Phytochemicals are compounds found in plants that reduce the mortality rate by promoting heart health and reducing the risk of chronic diseases. A 2015 study published in International Journal of Epidemiology noted that consuming a moderate amount of nuts everyday might reduce the risk of dying from various chronic diseases like heart disease, cancer, stroke, respiratory disease, and brain diseases. Although technically peanuts do not fall in the category of nuts, they share many nutritional properties of nuts, including monounsaturated and polyunsaturated fatty acids, vitamins, antioxidants, and fiber. According to a study published in Jama Internal Medicine in 2015, high intake of nuts, especially peanuts is associated with reduced risk of mortality. Experts suggest that half a handful of nuts everyday is more than enough to keep you hearty and healthy. Nuts are rich in protein and dietary fiber, which increases satiety. So after their consumption, you tend to eat less. Although, they are high-fat and high-calorie food, when consumed in moderation, they do not encourage weight gain. A study published in the American Journal of Clinical Nutrition in 2014 found that regular consumption of nuts over the long-term can help prevent obesity. It would be a good idea to mix all varieties of nuts in your daily intake. Enjoy your yogurt with a topping of few almonds or toss your salads with some pine nuts. Include nuts in your smoothies or make an Indian curry with a thick cashew paste. Berries are high in antioxidants and polyphenols that helps fight chronic disease and cancer. Blueberries, blackberries, strawberries, raspberries, and acai berries contain tons of antioxidants that delay aging. Recent research has found that the presence of high–levels of flavonoids, especially anthocyanidins, helps in reducing rates of cognition decline in older adults. According to a study published in 2012 in the Journal Annals of Neurology, long-term intakes of berries and flavonoids are associated with improvement in cognition. The study found that those who ate more berries had minds that were 2.5 years younger than those who didn’t. Blueberries: When it comes to nutrition, blueberries are loaded with nutrition. They are rich in essential nutrients like vitamins C and K and manganese, and dietary fiber. In addition, blueberries are rich in antioxidants because of their presence of flavonoids. The antioxidants in blueberries help prevent the onset of diseases like Alzheimer’s, dementia and age-related memory loss. A study published in the Journal of Agricultural and Food Chemistry in 2010 noted that blueberries supplementation for 12 weeks showed an improved memory function in older adults with early memory decline. Be cautious while eating blueberries. If taken in large amounts, it can increase the blood sugar levels in your body. So, moderation is the key. Acai berries: These Brazilian berries are rich in phytochemicals that possesses high anti-oxidant activities, and has anti-inflammatory, anti-cancer and anti-cardiovascular disease properties. A study conducted by Experimental Gerontology in 2010 noted that acai supplementation at 2% in the food increased the lifespan of female flies fed a high fat diet. The study shows that these berries may help alleviate oxidative stress related to aging. Blackberries: Blackberries contain antioxidants, elagic acid, Vitamin E and C. The polyphenols present in blackberries has shown a positive impact on human health, performance and disease. A study published in 2009 in Nutritional Neuroscience: An International Journal on Nutrition, Diet and Nervous System states that blackberry-fed aged rats showed improved motor and cognitive performance. Try to keep your blackberries dry when storing and they should last for two to three days. If you are refrigerating them, eat them once they are back to room temperature as they taste better when they are juicier. Add them in your ice creams or cakes to add that zing to your dish. Strawberries: Strawberries are an excellent source of potassium, fiber, many B vitamins, vitamin C, vitamin K, manganese, iodine, folate, omega-3 fatty acids, magnesium and copper. The bioactive compounds of strawberry have the potential to protect your skin from aging and oxidative damage. A study published in Molecules in 2014 noted that the antioxidant and anti-aging activities of a polyphenol-rich strawberry extract can promote a regenerative capacity of cells after exposure to pro-oxidant stimuli. Strawberries are highly perishable so should be eaten within 2 or 3 days. Some people are likely to develop allergies to strawberries, especially if you have pollen allergy. Strawberry allergies are most commonly experienced in mouth and throats – tingling, itching and runny nose. Strawberry leaves contain iron, calcium and vitamin C. These leaves are known to improve digestion. They can be used to make tea. Strawberry leaves should be consumed either immediately after picking or after they are completely dried. Some toxins are released during the withering process of the leaves. This toxin can irritate your stomach and can cause discomfort. Experts suggest consuming 3 or more servings of half a cup of blueberries and strawberries each week to keep your heart healthy. Fish is a major source of Omega-3 fats and is rich in Vitamin D and selenium that are high in protein and low in saturated fat. Omega 3 is an essential fatty acid that the body cannot manufacture and needs to be obtained through food. They are important for the brain as well as for normal growth and development. It must be obtained from your diet. Omega 3 fats help in improving your skin texture, firmness and keep it hydrated. One of the omega-3s fats Eicosapentaenoic acid found in fatty fish helps preserve collagen, a fibrous protein that keeps skin firm. This in turn helps you maintain a younger looking skin. Cold-water fish, such as mackerel, herring, salmon, and tuna, have the highest levels of omega-3 fatty acids. They contribute the largest amount of Docosahexaenoic Acid (DHA). The role of DHA is to ensure that the cells in brain and nervous system develop and function effectively. It also helps to prevent skin cancer by reducing inflammatory compounds that promote tumor growth. A study published in JAMA Neurology in 2005 states that dietary intake of fish is associated with slower cognitive decline with age. The study adds that the rate of decline was by 10% to 13% per year in people who consumed 1 or more fish meals per week compared to those who had lesser consumption. Two to three servings of cold-water fish is recommended per week. Who doesn’t know the benefits of green leafy vegetables? You have been hearing this since your childhood, but still you often underestimate their merits. Dark green leafy vegetables like spinach, lettuce and kale contain antioxidants lutein and zeaxanthin. They provide protection against UV rays. Exposure to UV light causes epidermal DNA damage, inflammation, oxidative stress.This increases the risk of skin cancer and skin aging. 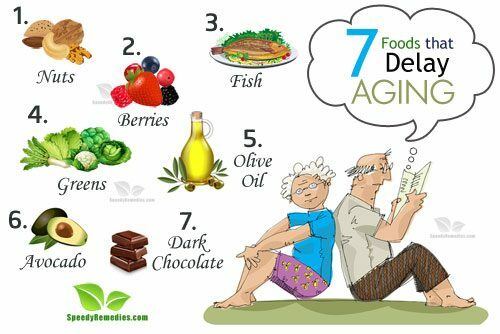 According to the National Institute on Aging, a diet rich in vegetables, especially green leafy vegetables and cruciferous vegetables like cauliflower, cabbage and broccoli, is associated with a reduced rate of cognitive decline. Another study conducted by Rush University Medical Center in 2015 states that increasing consumption of green leafy vegetables could offer a simple and affordable way of protecting your brain from Alzheimer’s and dementia. The study found that those who ate 1 to 2 servings per day had the cognitive ability of a person 11 years younger than those who consumed none. Early research suggests that eating plenty of high-ORAC fruits and vegetables, especially spinach and blueberries, may help slow the aging process in both body and brain. ORAC (Oxygen Radical Absorbance Capacity) is the ability of a food to quench the oxygen free radicals. These free radicals are responsible for causing oxidative damage, the main driving force in the aging process. The higher the ORAC score in a food, the better it is for you. A study conducted at Human Nutrition Research Center on Aging at Tufts in 1999 that high – antioxidant foods raised the antioxidant power of the blood by 10 – 25%. The study found that 10 ounces of fresh spinach produced the biggest increase in blood antioxidant scores in women. ORAC researchers suggest that eating a combination of foods having high ORAC scores has also boosted blood antioxidant score. Consuming your green veggies with a variety of vegetables of other colors will help maximize your nutrient intake. Widely touted as a super food, olive oil is renowned as one of the most nutrient-dense oil of all vegetable oils out there. Extra virgin oil is prized for its numerous age-fighting components. 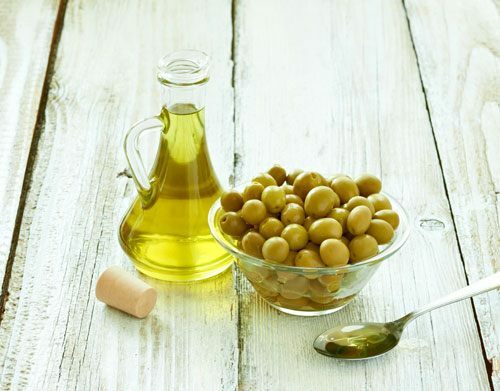 Polyphenols, present in extra virgin oil, a vital component of the Mediterranean style diet has been repeatedly associated with a reduction in age-related diseases. Olive oil contains monounsaturated fatty acids, considered to be a healthy dietary fat. A study published in Current Opinion in Biotechnology in 2012 notes that extra virgin oil, rich in phenolic compounds, are potentially beneficial in reducing the risk of chronic degenerative diseases and higher life expectancy. Although there are a number of varieties of olive oil out there in the market, extra virgin oil and virgin olive oil is considered to be of premium quality. As virgin varieties retain most of the nutrients from the olive fruit, virgin olive oils are believed to offer the greatest health benefits. Olive oil should be used within a year of bottling. It should not be exposed to direct sunlight so better not to keep it on your window sill. Be it trickling over your cooked pasta or infusing it into your cakes or muffins, there are a number of ways of incorporating olive oil in your daily menu. The recommended consumption is 2 to 3 tablespoons per day. Avocados are popular for their anti-aging properties and are considered as one of the safest fruits when it comes to chemical contamination as its thick skin protects it from pesticides. Its rising popularity is making it the new favorite fruit. This nutrient-rich fruit is rich in folic acid, vitamin B, E, potassium, omega-3 fatty acids, and mono-unsaturated fats. This makes them an anti-inflammatory agent. Avocados also contain carotenoids like alpha carotene, beta carotene, beta cryptoxanthin, zeaxanthin, and lutein. According to a study conducted by Clinics in dermatology in 2009, carotenoids may help to control ongoing oxidative and inflammatory damage by exposure to ultraviolet (UV), thereby reducing the risk of developing fine lines, wrinkles and other signs of aging. Another study conducted by Universidad Michoacana de San Nicolás de Hidalgo in Morelia in 2012 shows that avocado oil has protective effects against free radicals causing oxidative damage in your body. Oxidative damage leads to aging. Besides consuming avocado oil, you can even apply it on your skin for preventing the signs of aging. Apply a few drops of avocado oil every day before going to bed. Regular application can help you maintain a soft, hydrated and glowing skin. Avocado oil is also good for damaged and frizzy hair. Mash up half an avocado. Massage it into your cleansed hair and scalp. Leave it for 15 minutes before washing it off for a smooth hair. Avocados can also be used as a substitute for butter or oil in baking. 3.5oz avocados contain 14.66g fat, while the same amount of butter contains 81g fat. Substitute 1 cup of pureed avocado for every 1 cup of butter. Use it as mayonnaise on burgers or sandwiches. Adding an avocado to your salad or salsa as a topping can be a healthy option. According to a study published in the Journal of Nutrition in 2005, avocados can increase the absorption of carotenoid from salad and salsa. The average avocado consumption should be ¼ of an avocado or 50g four times a week. While choosing an avocado, always go for an unblemished skin and a soft flesh. Unripe avocados can be left in a brown paper bag with an apple or banana for 2-3 days at room temperature.This will quickly ripen them. Don’t refrigerate avocados, until they are ripe. Exposure to air can cause the avocado flesh to turn brown. Applying some lemon juice or vinegar over them and refrigerating them in an air-tight container can delay this process. For all chocolate lovers, this might come as a relief. Chocolate has the ability to prevent aging. But here’s the catch. It only works with dark chocolate. Dark chocolate is produced from cocoa beans that are high in a type of flavanols that are believed to protect neuron cells against degeneration and dementia. According to a study published in Nature Neuroscience in 2014, cocoa flavanol–containing diet has shown to reduce age-related memory decline in 50-69 year old adults. Another study published in the Journal of Cellular Biochemistry in 2013 suggests that flavanols in cocoa can protect your brain from neurodegeneration, or at least slow it down. Neurodegeneration causes diseases like Parkinson’s, Alzheimer’s etc. Although there are no hard and fast rules as far as consumption of chocolate goes by, but probably consuming smaller amounts of dark chocolate two to three times per day is beneficial. It totally depends on your insulin sensitivity, activity level, overall health, and the composition of the chocolate you are eating. Rely on your own judgment. If you experience any caffeine-like effects of having trouble sleeping or any other negative effects from your chocolate, it’s better to avoid it. Go for the ones with the higher cocoa and lower sugar content. The darker the chocolate, the higher the cocoa in it. Go for a chocolate with cocoa percentage of about 70 or higher. Cocoa flavanols in chocolates make them bitter, but flavanols are the ones that make chocolates a healthy option. Annals of the New York Academy of Sciences – Can Antioxidant Diet Supplementation Protect against Age-related Mitochondrial Damage? National Institute on Aging – Preventing Alzheimer’s Disease: What Do We Know? Universidad Michoacana de San Nicolás de Hidalgo in Morelia – Avocado oil: The ‘olive oil of the Americas’?